The first “Dakota Boom” was largely due to the amount of land claimed and the rapid increase in population between 1879 and 1886. During this time, more than 100,000 people settled in the Dakota Territory. The rapid influx soon caused political discord as to where to locate the capital. 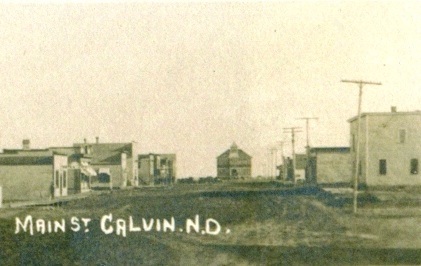 When the territorial capital moved from Yankton to Bismarck in 1883, the citizens in the south created their own constitution and named Pierre as the capital. 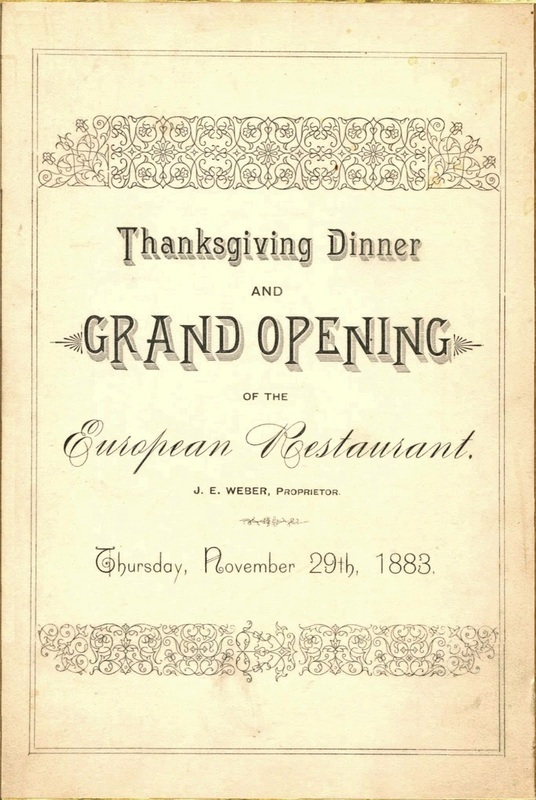 When the European Restaurant opened in Bismarck on Thanksgiving of that year, the holiday feast included a boiled New England dinner, as well as game dishes like baked haunch of mountain sheep and a sauté of rabbits with Bordelaise sauce. The dessert called floating island, comprising puffy clouds of softly poached meringue floating on a vanilla custard, would become a mainstay of French restaurants in New York City during the 1960s. The gilt-edged menu card shown below was printed by the Bismarck Tribune. Newspapers in the territory also served as job printers for the burgeoning community. 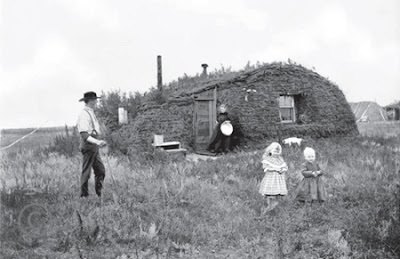 One of their most lucrative tasks was to publish the flood of legal land claims required under the Homestead Act. By 1889, the boom had been brought to an end by a three-year drought and lower wheat prices, reducing the torrent of emigrants to a trickle. On November 2 of that year, North Dakota and South Dakota were admitted to the Union as the 39th and 40th states. 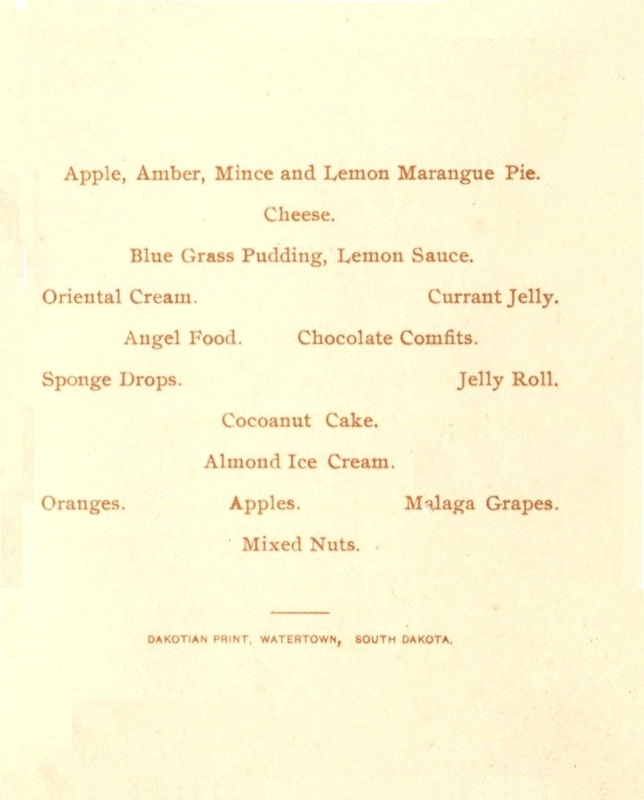 Three weeks later, “South Dakota” appeared in the address of the Dakotian, a newspaper in Watertown that printed this menu for the Arcade Hotel. 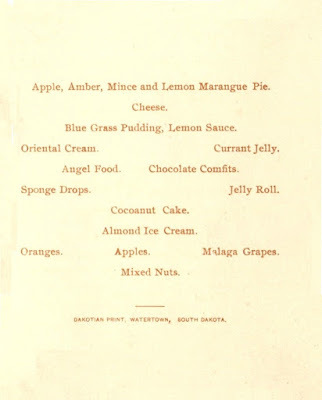 Watertown was a town of 2,600 and hub of the Chicago and Northwestern Railroad, the final carrier of the fresh seafood and other viands that made this holiday dinner special. 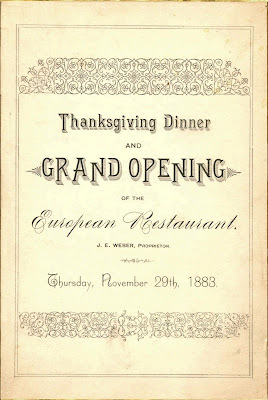 In the late 1880s, apocryphal stories appeared in pulp fiction about the Pilgrims and the first Thanksgiving. 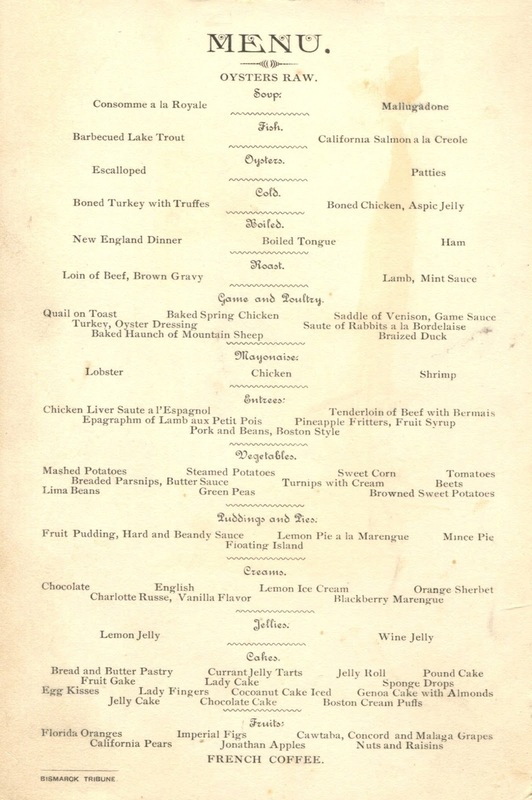 The so-called “Thanksgiving Myth” provided a ready-made tradition for immigrants who were arriving in droves. Indeed, by 1889, one-third of South Dakota’s population was foreign-born. They came from Norway, Germany, Russia, Ireland, and Sweden, all countries of about the same latitude, making it easier for farmers to adapt their crops to the new land. A second economic expansion began in 1898 when the national depression was starting to wane. This era of prosperity continued through the “Golden Age of American Agriculture,” the unusual period from 1909 to 1914 when everything went right for farmers. Yet, life was not easy on the broad expanses of the Great Plains. 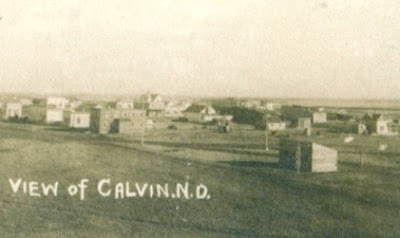 One can sense the isolation and loneliness in these photos of Calvin, North Dakota, a small town near the Canadian border founded in 1902 as a stop on the Great Northern Railroad. The population swelled to 350 residents at its peak. 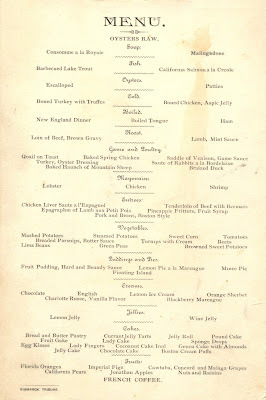 The menu below comes from the Great Northern Hotel in Calvin during its heyday in 1908. Although this hotel was primarily utilized by transient passengers, local residents may have dined there on occasion. 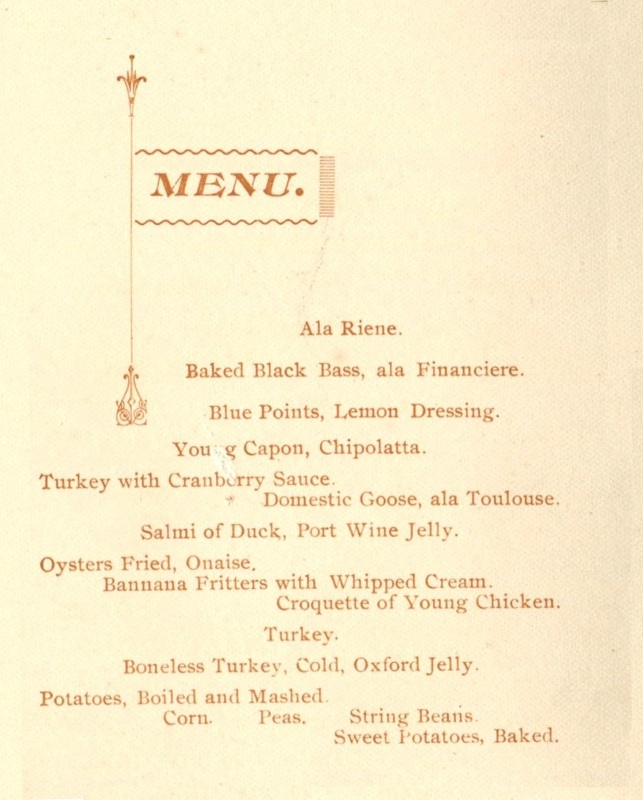 Oddly, there is only one dish labeled as an entrée—the sardine salad made with mayonnaise. Although Calvin is now a near-ghost town, North Dakota experienced another growth spurt beginning in 2006 when the Parshall Oil Field was discovered. After expanding for almost a decade, oil extraction slowed this year due to a decline in prices. While I have never been to North Dakota—even state tourism officials admit that it is typically the last state that people visit—it may be an opportune time to go there in search of ephemera that marks this latest era of prosperity, for who’s to say what might happen next in the ongoing boom-and-bust cycle of the Dakotas. 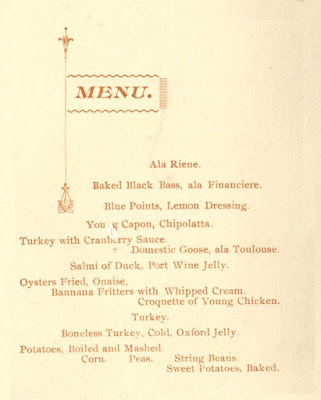 Henry, funny how all three menus had a oyster offering yet so far from any brackish water. Are there fresh water types? And no wine list for the European Menu. Sacre Bleu! 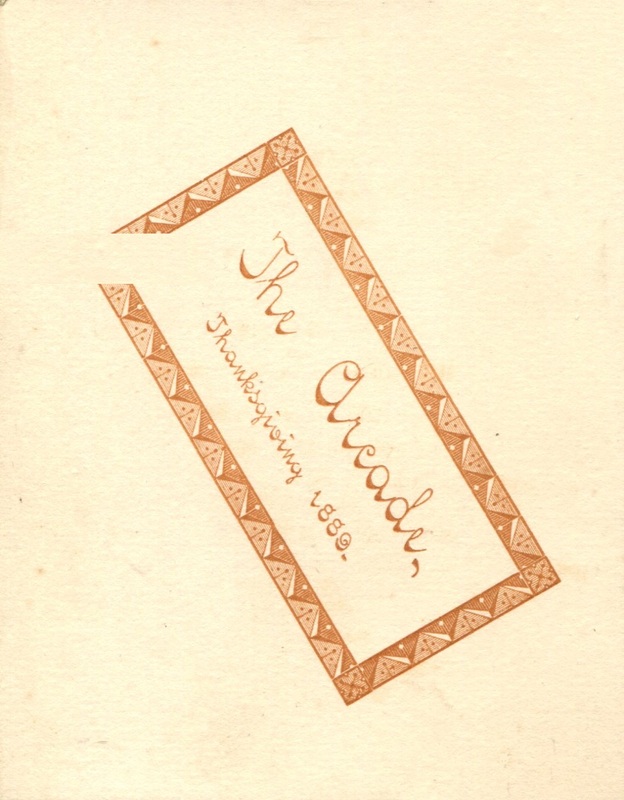 Am so happy to have found you on Twitter (and now here) and am having a great deal of fun reading the old menus you have collected, as well as the history behind them!